I took some liberties with this recipe because on Christmas Eve I couldn't find darn near anything! They still turned out pretty good but I think the original ingredients may have been better. Enjoy! Line 2 rimmed baking sheets with parchment paper. Melt the chocolate chips in a bowl in the microwave for about 1 minute, or until almost melted. Remove them and continue to stir until completely smooth. Place the red and green candy melts in separate bowls and microwave them for about 15 seconds at a time, stirring in between each interval until completely smooth. Divide the melted chocolate chips between the two pans. 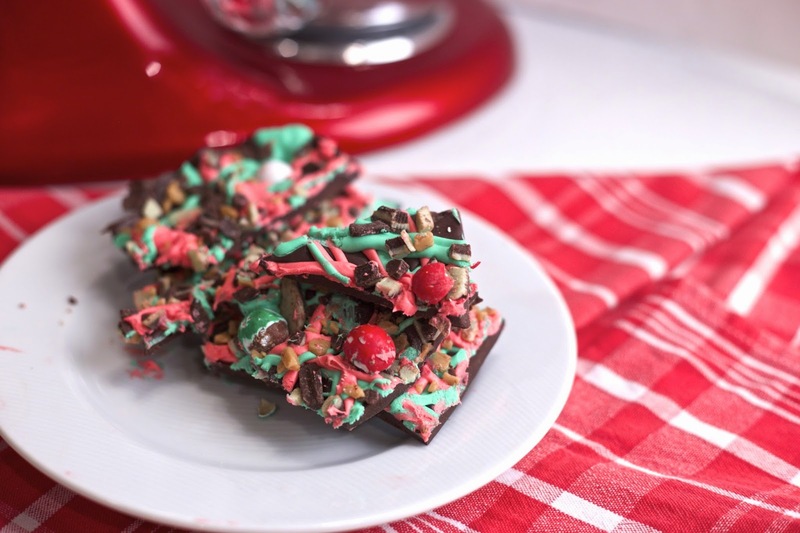 Spread the chocolate into a rectangle on each pan and then swirl the red and green melted candy into the melted chocolate. (I only showed pics of one pan, but make sure you make 2 pans or your bark will be way too thick!) I used a knife to swirl the red and green candy and make a marbled effect - just make sure you do this quickly because the candy will start to harden fairly fast! 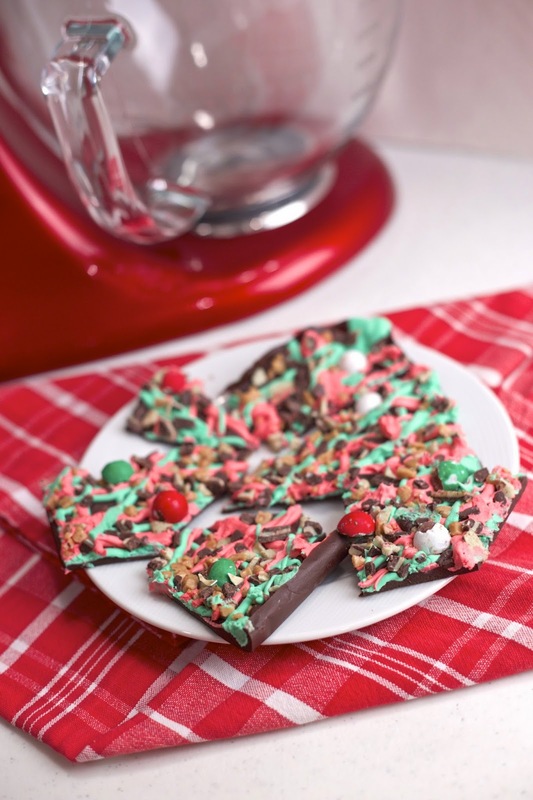 While the bark is still wet, sprinkle the top with the Andes baking chips and M&Ms. Press the candies gently into the chocolate and then place the pans in the refrigerator for about 20 minutes to set. Cut or break the candy into pieces.